Over in Dayton, in my old stomping grounds… there were alleys between all the streets. That’s just how it is in city blocks, a lot of times. The alleys were always the “unspoken sordid pathways” of the neighborhood. Most kids didn’t go through the alleys. I knew a lot who weren’t ALLOWED to “cut through” those back ways. But we did. A lot. In the earlier years of unsupervised exploration… probably first or second grade… I was running with a couple of other ruffians. And we were little scrap-mongers. Tomboy, snot nosed, dirt up to our ears and back again… knuckle-draggers. We used to go into those alleys. There were a lot of old garages, of course. I can remember one between Bruce Avenue, and Knecht Drive It was kind of dark green in color, peeling paint, limpy roof, a couple of broken out windows. We were certain, absolutely certain, there was something foul or nefarious in that garage. We used to lie in wait. We would watch that slightly ajar garage door… and just wait. A murderer might come out… or a robber… a ghost … bigfoot….. we just weren’t sure. But we knew it and we were afraid. We used to throw rocks at the garage door, in hopes of stirring up the evil. Digression. Back to the garage. It is metaphoric of so many situations in our adult world. We didn’t know anything about that garage. We didn’t know what evil lurked within. We had no proof. We just “knew it”… most likely because an older kid plugged the idea in our little heads. So we were full of fear… and reaction. I see it all the time now in our adult world. People don’t know about something, or it is different, or someone has “told them” it is bad, or wrong…. or against “the way” of the world. So they fear. And they react. Sometimes with hate. How about that for a true-ism? We believe what we believe. But sometimes it may be necessary for us to question that which we think to be true. Or to be open to new ideas or suggestions. Or… to listen, more than we speak. The bottom line is this. We shouldn’t fear the garage. Simply because someone told us too. It may just be someplace to put a car at night… after all. And if we would ever have the chance to explore that garage, we would find it is just that. No tricks. No evil. No harm. Now. 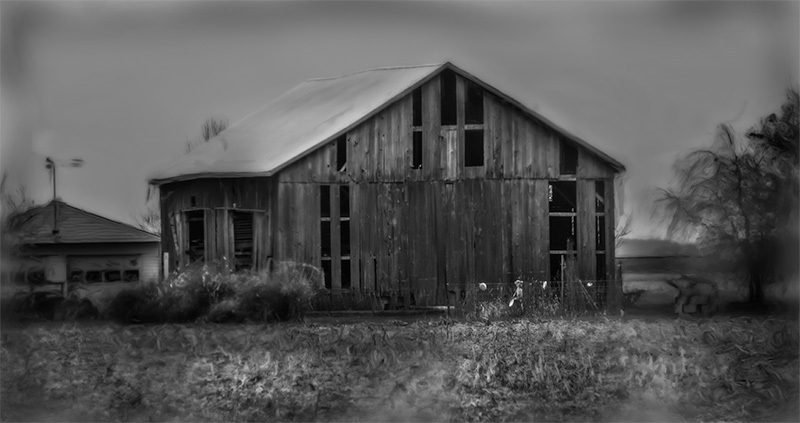 The Spooky Old Barn is an ENTIRELY different matter.